Professional massage is just that — professional. Professional therapeutic massage by an educated, certified massage therapist above all is ethical, safe and guided by the client’s needs and comfort level. The first thing that happens when I meet with a client is a discussion about their physical condition and their reason for seeking massage. If they are a first time massage client, I spend time describing what I will be doing and how massage is practiced. After our discussion, I leave the room and the client undresses to their comfort level and lies on the table under a sheet and blanket, which stays in place at all times. The back, one leg or one arm is uncovered one at a time. Clients may choose to only have massage on the back, neck and shoulders or the back and legs, etc. Some clients may not want foot massage and others may only want hands and feet worked on. You choose the massage that is best for you. A professional massage conforms to the client’s current needs. The goal of the massage may be for deep relaxation to alleviate feeling anxious or over stressed, to promote healing in a strained or injured area or to release chronically tense muscle group, perhaps work related issues. For first time clients I generally begin with a medium pressure massage, but over time as a client becomes familiar with what works best for them, feels best to them, they ask for the pressure they prefer. Pressure ranges from ‘light’ to ‘deep tissue’ with many subtle distinctions in between. Deep tissue massage manipulates the deeper aspects of the muscle tissue. Many clients prefer deeper massage on their backs than they do on their legs or neck. A good massage includes thorough communication and sensing by the therapist, but the client is always encouraged to speak up if pressure is too deep or not deep enough. It is your massage! Through experience clients learn what styles of massage they prefer, be it Swedish, flowing, specific (trigger point), or a combination of these, with or without stretching of large muscles (sports massage). There are many other modalities to try: reflexology, hot stone, shirodhara, craniosacral, Thai, shiatsu, to name a few. And prenatal massage is highly effective and encouraged all through a healthy pregnancy. Another concern many first time clients have is about falling asleep. It is my belief that when people become deeply relaxed during massage they drift in and out of a semi meditative state but are not sound asleep. I feel this is optimal for de-stressing and is a sign that the mind wants to relax as much as the body is relaxing. Doing this regularly can increase our clarity of thought. After the educational foundation is learned, massage is a very fluid and creative discipline. You will find wide variations between massage therapists in regard to style, philosophy, energy, modalities and strength! Find the therapist that best suits your needs or rotate between several of the best who have different styles! Above all massage is for the improvement of your well being. Relief, relaxation! This is best achieved when working with an experienced professional who has a strong positive intention toward creating a safe, healing, peaceful experience for all. 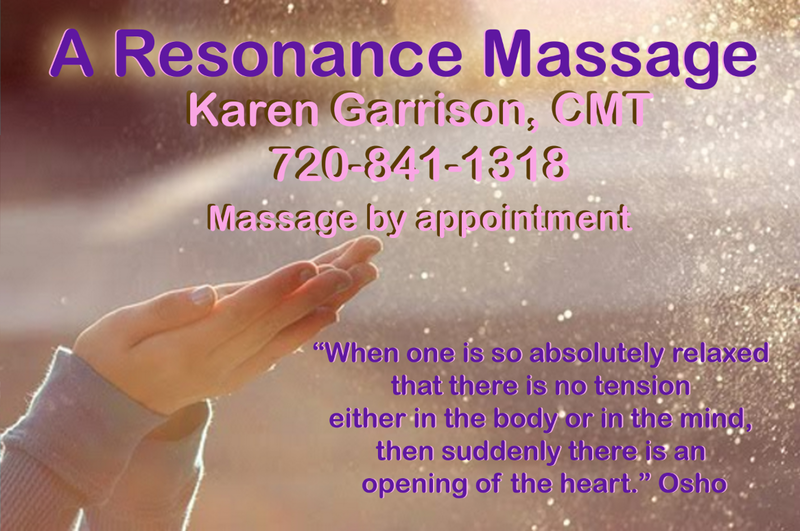 If you are considering trying massage I strongly encourage you to do so. For myself I was joyously amazed after my first massage and knew it had to become a regular part of my life. Over time I learned it is a part of my preventive health care routine and that I deserve it! It isn’t just for rare and special occasions. Receiving massage once or twice a month is optimal. Many people wait until a doctor recommends trying massage or someone special gives them a gift certificate. I’ve had several men who came for a first massage because their daughter gave them a Father’s Day gift certificate – and then they were sold on the many benefits and deep relaxation of massage. Know that you can choose massage before your body is in pain! ! However you get here – if you are considering massage – I hope it will be the first of many for you! Please call with any further questions regarding what to expect or about my modalities and philosophy. The body can heal and wants to heal. Massage can be a powerful contribution to maintaining your best health!